I made my annual pilgrimage to Salzburg, Austria in September to attend the premiere of a dear friends new movie and to promote my new book “Ariaaisms~ Spiritual Food for the Soul” which made its debut on Amazon.com in early September. I have traveled to Austria every year for more than 20 years now ever since my near death experience in the Alps which altered my entire life path. Walking on cobblestone streets where Mozart walked each day as the smell of baking bread hovers in the air while ancient cathedral bells clang still telling time in the old fashioned way, are a few of the many reasons I am always drawn back to the same vacation year after year. This trip provided me several new and wonderful events, one of which I would love to share with the world as it moved my heart and soul into high places; that was the “re-connection” with someone I obviously knew in another place and time long before I was Ariaa. The connection was so intense and so profound that it is not one I will soon forget. From http://www.thelivingmoon.com: Untersberg is mysterious and legendary: The Untersberg – called “sleeping dragon” by the Dalai Lama. The myths tell about time portals, lost persons and wondrous mountain dwellers like dwarfs. According to a legend, these dwarfs digged out the more than 400 caves in the Untersberg. But this is only one of many speculations about the mountain. It is rumored, that emperor Karl the Great (similar is claimed about Friedrich Barbarossa) sleeps in the mountain in a subterranean throne room together with his truthful knights and dwarfs for more than a thousand years. He´ll awake to the last battle between Good and Evil, when his beard has grown around his armor table 3 times and the ravens don´t fly around the mountain peaks anymore. Many legends deal with disappearance. Once, a lost hunter is said to have suddenly appeared to his own mourning service one year after his disappearance. According to another myth, an entire wedding company including the band disappeared in the Untersberg for 100 years. As we walked arm and arm through plush green fern Ute and I seemed to mystically morph. The sister love was palatable. I suddenly had several images and a strong past life memory of us and who we had been to one another. 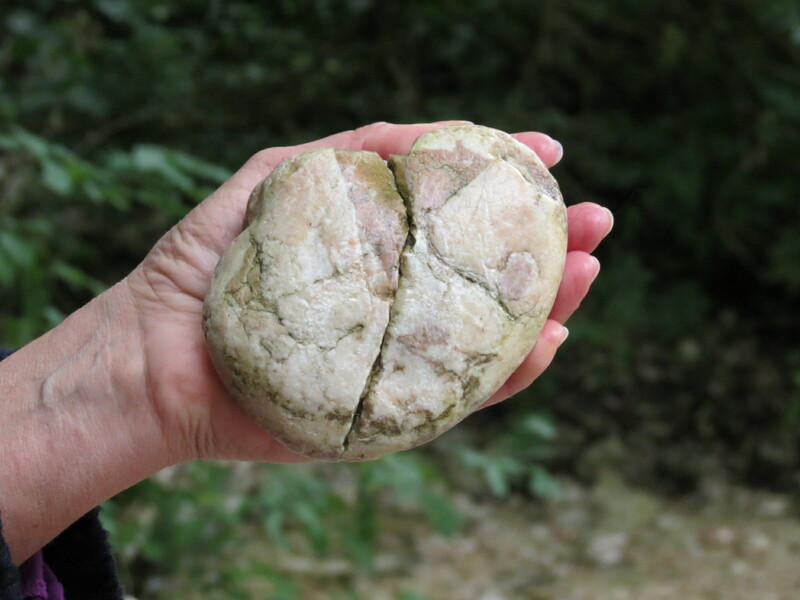 Another image was of a rock made of marble and it was in the shape of a human heart. I saw a cut right down the middle as if it had been precisely and cleanly cut in half. I knew this vision had great relevance to our intertwining. After hours we descended the mountain following along the path of the water falls which we had drank from earlier. As we began scouring through the shallow waters looking for a token rock to take home with us to commemorate this day I suddenly looked down and low and behold, THERE IT WAS! The human heart shaped rock I had seen just minutes earlier in my vision. Ute paused wondering if we could dislodge it from its resting place buried amongst the other river stones. To our surprise it practically leapt into our hands. I took the right side home and she the left side. We climbed and danced and played as if we were children discovering a new secret hiding place. We drank from ancient water falls which seemed to cleanse us to the depths of our existence. We prayed and meditated as we listened to the sounds of nature. We closed our eyes to behold the mystical creatures which live in this pristine haven. We came alive as we lay in rich plush beds of green fern and moss. We melded in a cosmic wonderland. It was one of those definitive magical experiences which happen to lots of people but many fail to see the magnitude of the moment and its ability to feed the soul. This experience not only fed my soul but it feed every sense within me and continues to delight my soul with every remembrance. This entry was posted in Austria, Love, mountain, mystical, Salzburg, Travel, Untersberg, Vacation and tagged Ariaa Jaeger, Ariaa.com, Ariaaisms Spiritual Food for the Soul, Austria, forest, mountain, mystical, Salzburg, travel, Untersberg. Bookmark the permalink. ← Ariaa.comEssays Ariaaisms~ Spiritual Food for the Soul~ Tidbits of Consciousness ~ What are You Leading With? Reblogged this on Ariaa Jaeger.